Here’s the last tangle in the heart-like type for now and then we’ll move along from this recent theme. Remember you can always find TANGLES BY TYPE by looking for that headline in the LEFT SIDEBAR (desktop view only). And here’s another way to find tangles of a similar type. Each tangle displays its “tags” in the dateline bar at the end of each page right above the Comments as shown in this image. The links are live and you can click on them there to find tangles of a similar type, or all the other tangles on the site by the same artist. I haven’t been tangling as much as I used to (since I submitted DeKore), but I always keep an eye on the new tangles that you send out. (And love them!) A few weeks ago there was a tangle with the zig-zag pattern as a base, and I suddenly was compelled to draw hearts out from the corners. I think there might be some fun ways to play with this. I dabbled in different ways to fill the diamonds in the middle. In the end, liked the effect of rounding the corners off. For my example of Luffline, I added Step 5’s rounding for the “oeufs” and then simply filled them in. In Kari’s example she gives them more contoured shading which is a nice effect. If desired you could continue to add the larger curves of Step 4 and grow Luffline outwards to fill a section of your tile. 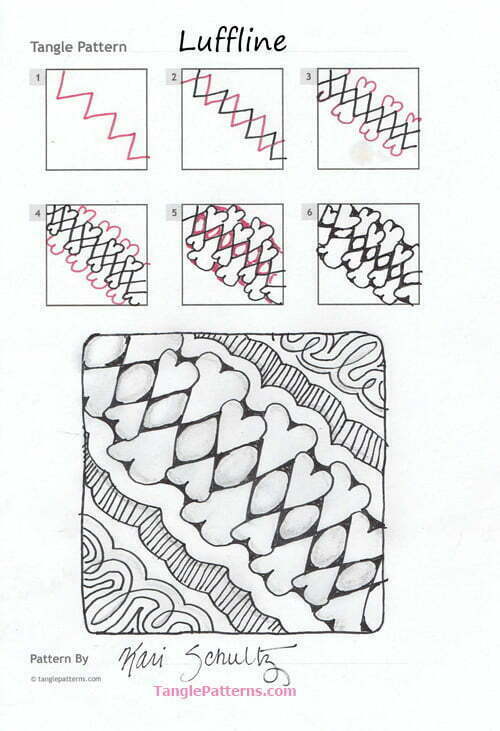 Kari illustrates the step-by-step instructions for drawing Luffline below and she features it as the main focus in a Zentangle® tile with some fancy auras. Check out the tag karis for more of Kari’s tangles on TanglePatterns.com.